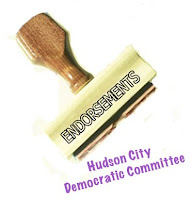 The Hudson City Democratic Committee is issuing an open call to Hudson residents who are interested in or are considering running for office in the coming 2009 election. All of the major offices in Hudson are up for election in 2009. Those considering a run for any office are encouraged to contact the committee at hudsoncitydemocrats@gmail.com or by sending a letter of interest to Hudson City Democratic Committee 245 State Street Hudson NY 12534. The committee would like to make clear that this call is completely open to all and encourages anyone, regardless of previous history with previous incarnations of the committee, to make contact.